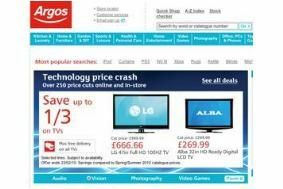 Argos 'technology price crash' runs until February 23rd | What Hi-Fi? The promotion covers TVs, DVD and Blu-ray players, iPod dock, headphones and games consoles. You can save up to a third on TVs, with £470 off a Sharp LC52DH66E Full HD LCD (now £929.99), £433 off a LG 47LH4000 100Hz Full HD LCD (now £666.66) and £120 off a Sony KDL-40V5500 40in Full HD LCD (now £699.99). Discounts on Blu-ray players include £70 off a Philips BDP3000/05, now down to £99. Alternatively, if you're happy to stick with DVD, you can save £60 on a Toshiba RDX-V59DT HDD/DVD-R/VCR 3-in1 recorder, now £249.99. There are savings of up to 25 per cent on iPod dock, with the Panasonic SC-SP100 EB-K at £112.49 (save £37), the Intempo RDI at £97.49 (save £29) and the Klipsch iGroove at £97.41 (save £32). Need some new headphones for your MP3 player? Then you can save yourself a handy tenner on Sennheiser's CX200 in-ears, now £19.99, or pick up a pair of iLuv 1301s in white for £5.99. For these and plenty more deals, head on over to the Argos website.